After the logs were restored to new condition and stained with Lovitt’s Natural Gold oil based wood finish, we came back over the home and applied chinking between the logs to keep the water from getting in, lower the power bill, and keep the spiders and insects on the outside where they belong! The rot extended into the rim joists and subfloor on this particular project. Rot can hide nicely in areas you wouldn’t expect upon first inspection. Sometimes rot can travel down spikes, internal checks in walls, log seams, and has a way of moving laterally along the core of a log. 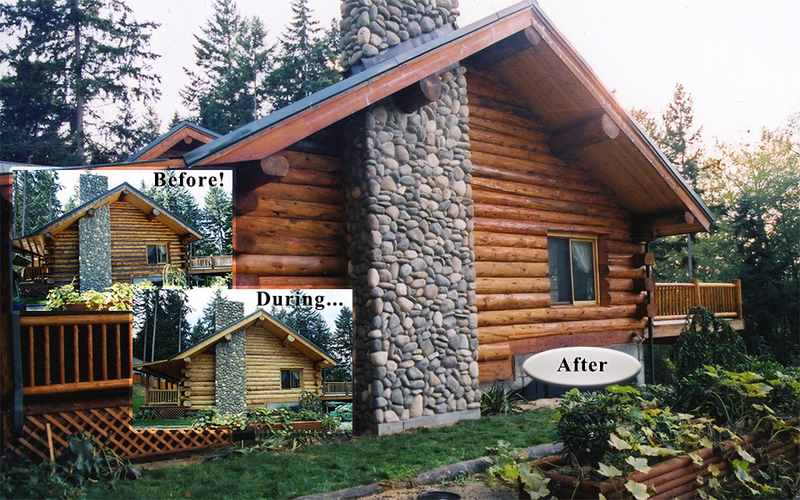 We have seen it all, our experience is unmatched in the log home industry regarding repair of log structures, our hundreds of rot repair references will tell you about our high quality craftsmanship and professional service and guarantees. Just ask them….. The Tobiason’s had a serious problem with rotted logs, here we are replacing a large section of one wall with new logs, not a job for an inexperienced contractor! For us, routine….